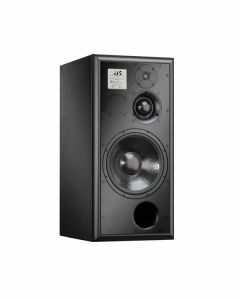 The free-standing ATC SCM100A SL Pro is a pair of active 3-way monitors which offer outstandingly low colouration at the highest sound pressure levels, superb dispersion, and excellent linearity. The SCM100ASL Pro is based around the same tweeter, midrange and amp configuration as the SCM50ASL Pro, but using a 314mm bass driver in a larger enclosure. Maximum continuous SPLs of up to 115dB/1m are possible. 4th order active crossovers produce a highly linear amplitude response for both direct and ambient fields, contributing to exceptional stereo imaging. Full “SL” spec 12 Ì‹/314mm bass driver. On board ATC grounded plane 350W Tri-amplifier. n LF contour control.